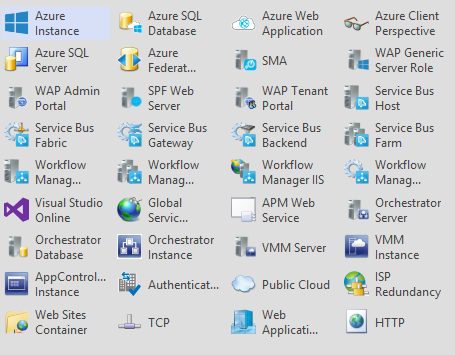 Well, it's been a few months since I last had a chance to work on some new Visio stencils and finally, I've managed to put one together for the relatively new Windows Azure Pack (aka WAP) and have bundled into the same stencil, some graphics for Windows Azure too. This stencil contains images that cover things like the WAP Admin & Tenant portals, SPF Web Server, SMA, Service Bus and Workflow Manager. I've also thrown in things like Visual Studio Online with its Global Service Monitor and APM capabilities, Orchestrator, VMM, AppController and standard Windows Azure roles and functions. I'd like to think that the first description isn't applicable to me (although I'd say some of my friends would probably disagree with me on that one!). The second and third descriptions however, definitely come close to getting it right. When I come across a piece of technology that I'm passionate about, then you'll hardly get a word in when I get going on the subject! This brings me to the reason for me putting this post together. If you've read even a handful of blog posts from me in the past, then you'll know that a lot of them are focused on Microsoft's System Center Operations Manager (SCOM) application. 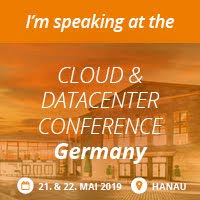 Delivered as part of the System Center 2012 R2 suite of Cloud and Datacenter management products, SCOM is their flagship tool for monitoring the health and performance of your IT environments and I've worked constantly with it for nearly 5 years. During that time, I've seen SCOM develop into a truly heterogeneous platform monitoring solution that can span across on-premise and public clouds and the geek in me has well and truly ensured that I studied every piece of documentation, blog post and case-study on SCOM that I could get my hands on! 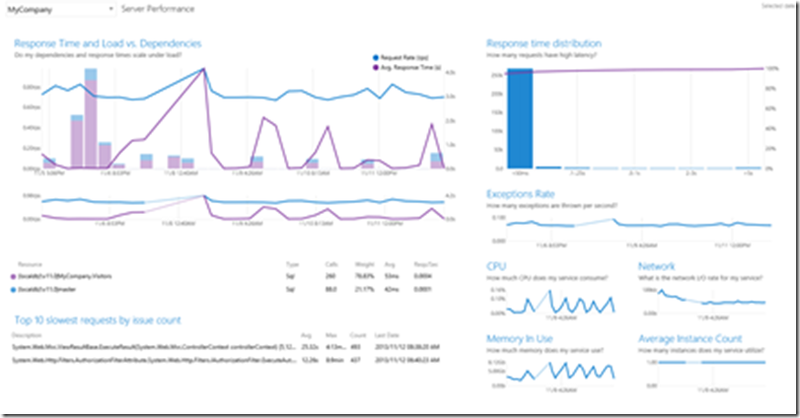 In the original release of SCOM 2012, we were treated to our first glimpse of Application Performance Monitoring (APM) which, in a nutshell, enabled IT Operations guys like me to bring deep-dive 'code-level' answers back to the table for Developers on how their applications were performing. This new synergy was known as 'DevOps'. A couple of years back, I wrote a short blog series about APM and it's a testament to the technology that today, this series is still one of the most visited on my site. When SCOM 2012 Service Pack 1 was released, it came with an integration to a new technology called Global Service Monitor (GSM). What this essentially enabled us to do was to get an 'outside-in' perspective of our web applications by channelling monitoring information from the Windows Azure platform back into the on-premise SCOM environment. With APM and GSM integrated into SCOM, we were starting to see a picture forming of a full 360 Degree view of our applications health and performance. In October 2013, System Center 2012 R2 was released and SCOM came with a small (but significant) number of infrastructure changes that added more flexibility and autonomy to the 'DevOps' story. Around the time of that release, I presented a session at the System Center Universe Europe conference titled 'What's New in System Center 2012 R2 - Operations Manager'. One of the key takeaways that I wanted people to leave my session with was the change to the old 'Operations Manager Agent'. This old agent became the new 'Microsoft Monitoring Agent' which had new capabilities (on top of all the existing functionality) to run as a standalone agent separate to SCOM. This could then be used as a .NET APM and Intellitrace collector plugging directly into IIS and Visual Studio. 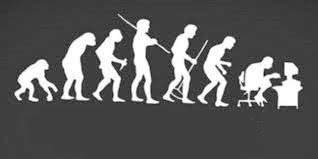 The importance of the change to the old SCOM agent started to become apparent when Microsoft announced the preview of the new Application Insights technology that came bundled as a feature of the new Visual Studio Online - which is essentially an evolution of Team Foundation Server. The reason the new SCOM Microsoft Monitoring Agent (MMA) is significant is that it's no longer exclusive to just SCOM. You guessed it - Application Insights also uses this same agent (it does however need to be running System Center 2012 R2 Update Rollup 1 which was just recently launched). 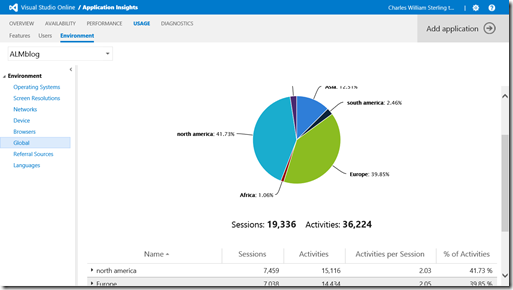 So what exactly is Application Insights? It gives the various teams that have responsibility for the maintenance of an application (development, IT operations etc. ), the capability to monitor the availability, performance, and even usage metrics of their applications and services. It does this by making use of the same type of technology that we have available through SCOM with Application Performance Monitoring (APM), Global Service Monitor (GSM) and the Microsoft Monitoring Agent. All of this is managed from the cloud - so no need for a fully loaded desktop client or database to be deployed locally on your sites. Information gathered from these different areas is then integrated back into the development tools and processes through Visual Studio to truly enhance the application lifecycle management process. Although AI is only in it's infancy as an emerging piece of armoury for your toolkit, it's definitely something to keep in mind if you want to feed the inner 'geek' inside you! 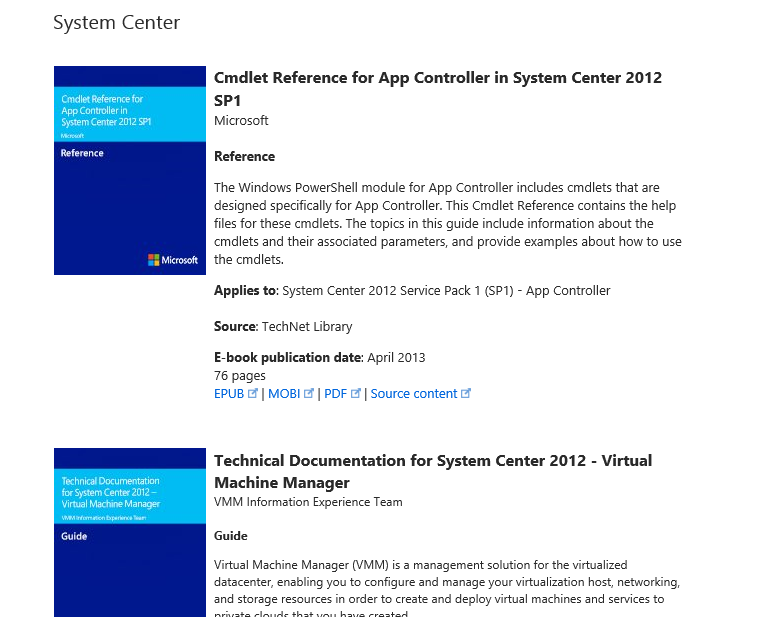 System Center Service Manager (SCSM) is here to stay! If you've been listening to the rumour mill over the past 12 months, then you might have heard some people state that System Center 2012 R2 - Service Manager has had its day and that it would be retired soon. My good friend and co-author on the Mastering Windows Server 2012 R2 book - Christian Booth (Microsoft) - has just written a blog post on the System Center Engineering Team blog that squashes those rumours. His post not only gives confidence to existing and potential customers over the viability of the product as we know it, but also mentions their plans to take it forward and make changes for the better to deliver a consistent and quality solution. This is great news for anyone working in the System Center space as it shows that instead of pumping all their investment and development resources into cloud-based solutions such as Azure, they are still more than focused on the on-premise System Center offerings that we all know so well! 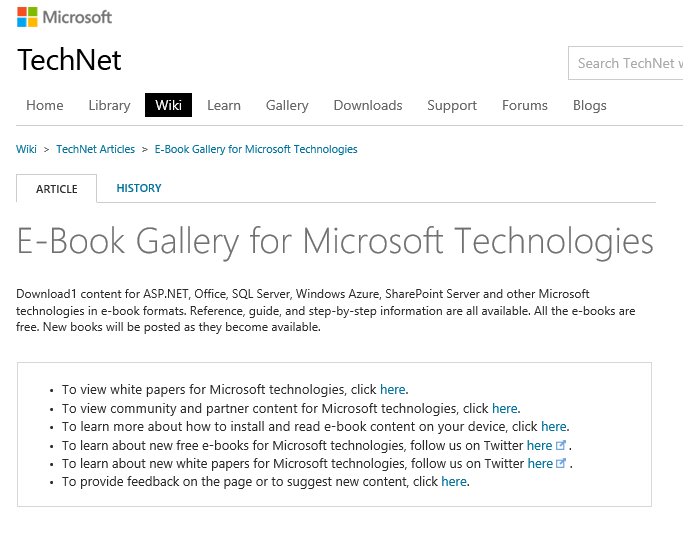 E-Book Gallery for Microsoft Technologies - Your One Stop Shop! I've just seen a tweet from Microsoft's Yung Chou about a relatively unknown TechNet Wiki page titled the 'E-Book Gallery for Microsoft Technologies'. This Wiki page has easily over 100 different E-Books covering technologies such as Lync, SharePoint, SQL, System Center, Visual Studio, Azure (the list goes on and on) and there's also a diverse number of e-books in languages other than English. The best thing about all these e-books is of course that they're all FREE! I highly recommend you check out this excellent resource and get the downloads going for as many of them as you need to keep in touch with the growing number of different technologies that Microsoft has to offer. Microsoft have just released a new Team Foundation Server (TFS) 2013 management pack for System Center Operations Manager (SCOM/OpsMgr). 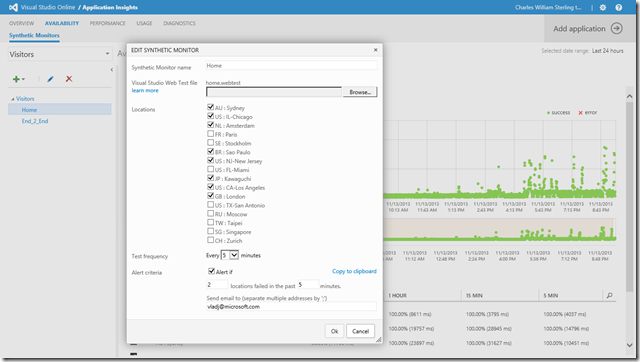 "The Team Foundation Server 2013 Monitoring Management Pack provides both proactive and reactive monitoring of Microsoft Team Foundation Server 2013. It monitors TFS components such as application tier server instances, team project collections, build servers, and proxy servers. The monitoring provided by this management pack includes availability and configuration monitoring, performance data collection, and default thresholds. You can integrate the monitoring of Team Foundation Server components into your service-oriented monitoring scenarios." This MP is essentially exactly the same as the TFS 2012 MP with the only exception being that it now supports TFS 2013. 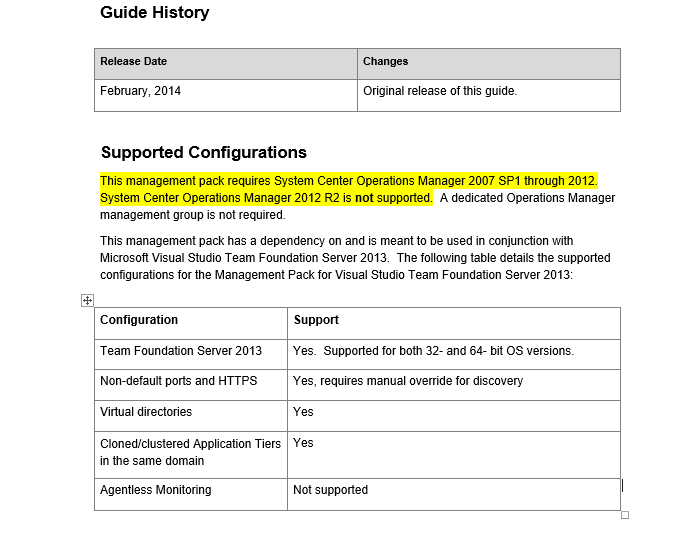 It's not supported to run on System Center 2012 R2 - Operations Manager! But, if you're running the latest and greatest version of SCOM 2012 R2, then you'll have to wait for support to follow I'm afraid. Hopefully this post saves some people a bit of time!